Lonely, inspired by one of Pablo Neruda's love poems. "I was so lonely, even the birds fled from me..." The figure is seated underneath an African Baobab tree which is a symbol for endurance, wisdom and fertility. 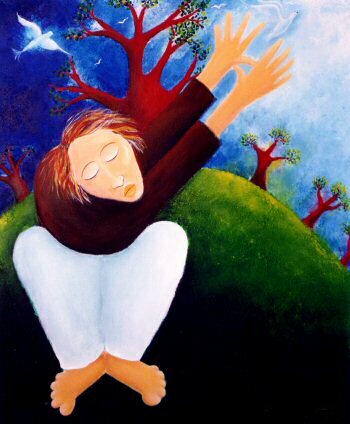 His hands are grasping up into the sky in an effort to nestle a bird to comfort his tortured heart. The figure�s closed eyes embodies his feeling of despair.